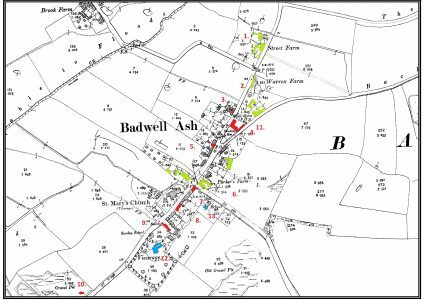 If you include the farmers themselves, that’s 61% of the whole population of Badwell Ash who were employed on the land in comparison to just 29% in 1911. Additionally, most if not all the “manufacturing” would have been associated with agriculture, such as the Blacksmith, the Wheelwright and the Waggon and Cart Builder. This increases the percentage of people working in agriculture to 66%. 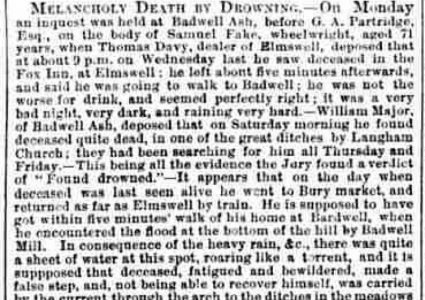 The high numbers of people working in agriculture in Badwell throughout the C19 remained consistent despite the influence of the industrial revolution which caused a decrease in agricultural labourers in other parts of England and Wales. 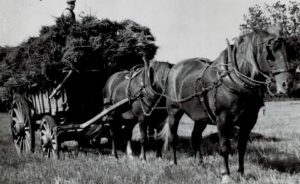 Even the Agricultural Depression in the 1870s and 1880s caused by the dramatic fall in grain prices following the opening up of the American prairies did not, in this area, seem to result in a significant drop of people working in agriculture. The total amount of land growing cereals in England and Wales in 1870 was 9.4m acres; by 1898 this had declined by 22% to 7.4m acres. During the same period, the amount of land under permanent pasture increased by 19%. This situation remained fairly constant until 1914 when it increased dramatically. 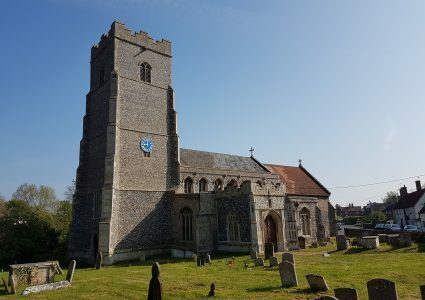 The fact that the majority of people in Badwell Ash worked in agriculture is not at all surprising given that Suffolk, along with Norfolk and Cambridgeshire had the highest percentage of arable land in England throughout the C18 and C19. Given that the majority of people worked on the land throughout the C19, it’s interesting to look at the breakdown between the various “skills” within agricultural employment. Many of these “skills” related to the horse and its use in farming. 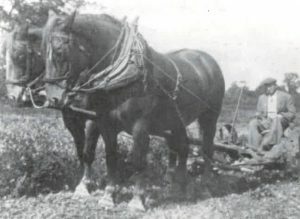 In Suffolk, that horse was primarily the Suffolk Punch, the oldest breed of heavy horse in Great Britain, which dates from the sixteenth century. Steam mechanisation in late Victorian England started the decline in working horses on the farm but even as late as the 1870s, there were still well over 3.3 million horses in Britain. In 1900, that number had dropped to 1 million, but by the mid C20, mass mechanisation brought about by the demands for increased food production due to World War II and increased farm mechanisation dealt the Suffolk a severe blow and numbers fell dramatically. There were instances of farms getting rid of forty horses in a single day which led to a glut of horses on the market and the only buyers were the slaughter houses. In 1966 only nine Suffolk foals were born. Extinction was imminent. Today, there are approximately 300 Suffolk Punches in the U.K with 30-40 pure bred foals born each year. Drover: A person whose job is to herd sheep or cattle in groups on the roads. Pigman: A person who buys pigs and then sells them off for profit. Rat Catcher: A person who catches rats for a living. Warrener: Someone who looked after a rabbit warren. Yeoman: A person who holds and cultivates a small landed estate.